Ask EV drivers what they don’t like about their electric car experience and the chances are most of them would say charging their vehicles away from home is their least favorite thing. Now, researchers in England are exploring the possibility of making wireless recharging available on some motorways, the English equivalent to our interstate highways. The government hopes the new technology will encourage more drivers to switch to an electric or plug-in hybrid car. Off-road trials of the Dynamic Wireless Power Transfer technology will begin later this year after the completion of a bidding process to select a developer. The trials will involve fitting vehicles with wireless technology and testing the equipment, installed underneath the road, to replicate motorway conditions. The trials are expected to last for approximately 18 months and, subject to the results, could be followed by road trials. 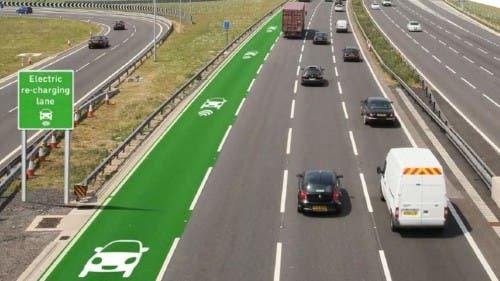 As well as investigating the potential of wireless power, Highways England also says it is committed to installing plug-in charging points every 20 miles on the motorway network as part of the government’s Road Investment Strategy. These are the first trials for wireless charging roadways. They will show how the technology would work on the country’s motorways and major A roads, allowing drivers of ultra-low emission vehicles to travel long distances without needing to stop and charge the car’s battery. Electric and hybrid car sales are on the rise in Britain, where a total of 9,046 ultra-low emission vehicles were registered in the first quarter of 2015 — a rise of 366% from the same period in 2014. The UK government has committed itself to an 80% reduction in carbon emissions by 2050. In 2013, 25% of UK carbon emissions were from transport, so there is a need to increase the use of low carbon vehicles (LCVs). Wireless recharging technology could help meet that need.